Author: Yashwant J Mahale , Vikram V Kadu . Background: Various treatment modalities are used for the treatment of GA-3B injury, yet determining the choice of treatment is difficult. We report fifteen such cases, of which twelve were treated with DCS and 950 plate and three with LCP because of minimal bone stock at the distal end (condyles) along with non- vascularised dual ipsilateral fibular strut graft and cancellous bone grafts from iliac crest. Materials and Methods: We performed this study from 2000 – 2014. We studied Total 1176 cases of supracondylar fracture femur of which 15 were of type GA-3B. The study consisted of eight males and seven females, eleven were right sided and four left sided. Fifteen patients underwent surgery (twelve were treated with DCS and 950 plate, three with LCP plate) with dual ipsilateral fibular strut graft and cancellous bone graft from iliac crest. Thirteen had functional range of movement (avg 0-1170), one had range of movement 0-70o and one had range of movement 0-15o at knee joint. Fractures united in all fifteen patients with average period of union twelve weeks and all returned to previous work. Immediate treatment consisted of debridement, primary closure, proximal tibial skeletal traction and broad spectrum i/v antibiotics. Once the wound was healed, surgery (open reduction internal fixation (ORIF) with plating with ipsilateral dual fibular strut grafts and cancellous graft) was performed. Result and Conclusion: We performed two-stage surgery in all the cases. First in the form of debridement and skeletal traction and secondly, definitive fixation was carried out. The current study demonstrated that ORIF with (DCS and 950 / LCP) plate with dual ipsilateral non-vascularised fibular strut graft and cancellous bone grafts from iliac crest is a good modality for open supracondylar fracture femur with bone loss with good results and functional range of movement. This is a small study with favorable results. However, it requires large study group to prove this technique beneficial for treating such fractures. Keywords: GA-3B, bone loss, fibular strut graft, iliac graft, 95 DCS, LCP. Open supracondylar femur fractures are rare complex injuries complicated by bone loss, contamination, compromised soft tissues, and poor host condition. Fractures of the distal part of the femur are difficult to treat and present considerable challenges in management. Severe soft tissue damage, comminution, extension of fracture into knee joint, neurovascular damage and injury to the extensor mechanism lead to unsatisfactory results in many cases whether treated surgically or non-surgically. Complications such as angular deformity, knee stiffness, and non-union persisted after non-operative treatment suggesting surgical intervention as the choice of treatment. We report 15 such cases treated with ORIF and plate (DCS and 950 / LCP) with ipsilateral dual fibular strut graft and cancellous bone grafts from iliac crest. This is a prospective study conducted at ACPM medical college and Mahale accident hospital since 2000 to 2014. Total cases of supracondylar fracture femur were 1176 of which 15 cases had GA-3B injury. We reviewed patients with open supracondylar fracture femur with bone loss. All the clinical notes and radiographs of the patients with GA-3B injury were reviewed and relevant information was obtained. The patients were followed up three monthly until the fracture was united and at one year the patient was assessed radiologically for fracture union and clinically for pain, deformity, work capacity, shortening, infection and whether he has returned to his routine work (Neer knee score). Thirteen patients had functional range of movement at knee joint (avg 0-1170), 1 had 0-70o and 1 had 0-15o, all fractures united well, average period of union twelve weeks, no pain and all returned to activity of daily living. It consisted of emergency and definitive treatment. Once the patient was brought to emergency department the patient was first resuscitated and stabilised. The emergency treatment consisted of wound toilet followed by debridement and primary closure. In cases of opening up of the condyles due to inter-condylar extension temporary fixation with two k-wires was performed (six cases). Proximal tibial skeletal traction was applied. Broad spectrum antibiotics were started. Wound was inspected after 48 hrs and culture sensitivity was sent, according to which specific antibiotics were started till the wound has healed (average period – two weeks). Once the wound was healthy, aspirate from fracture site was sent to culture sensitivity and if found sterile, surgical procedure in the form of ORIF with DCS and 950 plate (twelve patients) or LCP (three patients) along with dual ipsilateral non-vascularised fibular strut graft and cancellous bone grafts from iliac crest was performed. Post-operative care consisted of i/v antibiotics (according to culture sensitivity), long knee brace with hinge and bedside physiotherapy (quadriceps strengthening exercises and ankle exercises started on day 1, knee flexion and extension after suture removal; two weeks). The patient was kept non-weight bearing for six weeks, and partial weight bearing started after six weeks depending upon fracture union. On the basis of radiological union, full-weight bearing was started after twelve weeks. The patients were followed-up at every three months and were assessed according to Neer Knee Score; clinically (pain, work capacity, joint motion, function) and radiologically (fracture union and implant position) upto one year. Fifteen cases of open supracondylar fracture femur between 28-68 yrs of age (average age being 48 yrs), of which eight were males and seven females, eleven were right and four left sided, eight were labourers, five housewives and two performing sedentary jobs. All had suffered major road traffic accident. Three patients had associated injuries (one had ipsilateral wrist dislocation and ipsilateral tibia fracture, one had ipsilateral hand injury and one had ipsilateral tibia fracture). Twelve patients had laceration on the lateral aspect of thigh and three over anterior aspect damaging the extensor mechanism. Thirteen patients presented on the day of trauma (between 2-10 hrs) whereas two presented late (six weeks old and three months old). We used 95 DCS in twelve patients and LCP in three patients. Average ROM was 0-117 degrees. Two patients had decreased ROM (one had 0-700 and other had 0-150). These two patients who presented late were treated at another hospital primarily and were reffered to us (one had two cm of shortening and the other had infection with discharging sinus). We used the neer knee score to assess the results of our study and found that thirteen patients had good results, one had fair result and one showed poor result. Twelve patients underwent (DCS and 950 plate) with ORIF with ipsilateral dual fibular strut graft and cancellous bone grafts from iliac crest except three patients where LCP was used. Fourteen years of follow-up was obtained. All fractures united well with average union time of three months. Thirteen patients had average range of movement 0-117 degrees. One patient had 0-70 degrees with shortening of two cm, and one patient had 0-15 degrees. Thirteen patients had excellent results while one had fair and one poor result. All the patients returned to their routine pre-operative work. In our case series, two patients suffered complications post-operatively. One patient had two cm of shortening. The shortening of the patient was missed pre-operatively. Also the fracture being 6 weeks old and associated with ipsilateral tibia fracture and wrist dislocation, the injury to surgery time was prolonged and so the patient landed up with shortening. It is therefore recommended to take appropriate measurements of femur comparing the contra-lateral limb pre-operatively in order to plan the proper line of management and to avoid limb length discrepancy. One patient had infection with discharging sinus at the operative site. This patient presented to us three months after the injury. He was taking treatment somewhere else where his tibia fracture was treated with interlock nail and debridement for femoral laceration. No primary closure was done and the wound was infected. Appropriate aseptic measures were taken before, during and after the surgery and antibiotics according to culture sensitivity report. The laceration being on anterior aspect of the thigh added to the complication by damaging the extensor mechanism resulting in poor functional range of movement. Therefore, we recommend thorough debridement with primary closure over drain on day one or secondary closure in the form of plastic surgery, with appropriate antibiotic coverage according to culture sensitivity along with skeletal traction. The aim of this study is to find out mechanism of injury, assessment of results of the operative technique and comparison of results with other available studies. The supracondylar region of femur is a junction of the cylindrical and flat bone and thus is weakest part of the distal femur hence it gets burst out with the major RTA. This mechanism of within outside injury leads to fracture fragment being exposed to the external environment. This leads to the fracture fragment being thrown out from the fracture site due to heavy force which leads to bone loss with irregular damage to soft tissues and often damage to quadriceps. The fragment which makes up for the bone loss is generally lost at the accident site. These types of fractures are usually caused by axial load to a flexed knee during major RTA. The fracture being rare and complicated by bone loss, soft tissue injury and contamination, its treatment and surgical management is proving a challenge for orthopaedic surgeons. Infection and stiffness are major complications. Wound toileting and initial debridement with all aseptic precautions plays a vital role in successful outcomes of such fractures. Treatment of such fractures is challenging for orthopaedic surgeons and therefore we aim at; 1) soft tissue healing, 2) bridging bone defect with bone grafts, 3) rigid fixation, 4) achieving limb length, 5) restoring range of movement, 6) pain free limb and 7) returning to pre-injury status. Various modalities such as amputation, ilizarov and ORIF with plate are available for treating open supracondylar fracture femur with bone loss. Amputation though not a limb salvage procedure, is a single stage procedure and patient gets back to his routine activities with the help of prosthesis earlier. Also the patient is not bed ridden and does not need to undergo multiple surgeries. Limb salvage procedure includes ilizarov and ORIF with plate. In cases of ilizarov fixator, debridement with wound toileting and ilizarov ring fixator with or without bone grafting or docking is required. In cases of ORIF with plate, for soft tissues primary debridement with wound cover or plastic surgery can be done. For fracture, skeletal traction application followed by ilizarov ring fixator or definitive management with implants viz. angle blade plate, condylar buttress plate, LCP, 95 DCS can be used. For bone loss, cortical as well as cancellous bone grafts are required. With evolvement of science, Ilizarov technique is now currently considered as the treatment modality for such fractures. Though ilizarov fixator can be applied on day one after thorough debridement of wound, multiple surgeries (corticotomy, docking, bone-grafting etc.) are required. These procedures being needed, the patient may undergo mental and financial stress every time during the surgery. The union time is also longer. Moreover, the patient has to carry the ring fixator for a longer period of time, increasing psychological discomfort to the patient and knee stiffness. Neuro-vascular injuries are also known. In our case series, we did debridement with primary closure for soft tissue along with skeletal traction for fracture. Definitive management for fracture consisted of 95 DCS plate and non-vascularised dual ipsilateral fibular strut graft and iliac cancellous bone grafts to fill the bone defect. As this plate is a strong construct, it gives rigid fixation allowing for early mobilisation of knee post-operatively. Only in cases where bone stock at the distal end of femur was minimal and insertion of condylar screw in the femoral condyles was not possible, we used locking condylar plate with multiple screws in distal fragment. The dynamic condylar screw is the implant engineered by the AO/ASIF group for use in management of distal femoral fractures and subtrocanteric fractures. The dynamic condylar screw has been recommended as the method of choice [2,3,4,5,6] for the treatment of supracondylar and intercondylar femoral fractures. Fixation with DCS and 95o plate provides rigid construct and therefore movements at the knee joint can be initiated early. It provides rigid fixation of the fracture, early mobilisation and weight bearing with functional range of movement with minimal complications. In cases, where minimal bone stock is left at the distal end of femur (condyles), insertion of 95 DCS is not feasible. In such cases, locking condylar plate can be used. Insertion of multiple screws in the condylar area provides enough stability to start physiotherapy early which is seen in our three cases. Use of dual ipsilateral fibular strut graft helps in achieving the desired length of the limb and also bridges the site of bone defect effectively . Fibular graft of excess length was harvested so that it could be trimmed as necessary. Two struts were placed in a right angle manner (first along the outer cortex of the bone at the defect and second from the proximal shaft to medial condyle (Fig A). The strut was pushed into one of the fracture fragments and the exact length of graft that needed was trimmed. Once the final shaping of the graft was done, the fracture was reduced. Moreover, use of cancellous bone grafts all around the fibular strut graft helps in achieving osteosynthesis at the fracture site. These grafts (fibular strut and iliac cancellous graft) are taken from the ipsilateral side of the fracture so that the disability remains confined to one limb and the contra-lateral limb is normal allowing early post-op ambulation. Timing of presentation plays a crucial role in functional outcome of these fracture treatment. Results are excellent with functional ROM in early cases, while in cases with late presentation the results are fair to poor. Open supracondylar femur fractures with critical sized bone defects requires diligent surgical timing in order to optimise the host and wound bed (8). Thorough initial debridement and early definitive fixation is required for sterilisation of the wound and achieving functional ROM. Once the patients have recovered from their other injuries and the soft tissue sleeve has revascularized, bone grafting with internal fixation allows for rigid fixation of the femur and offers the biology these fracture patterns require for successful union without infection. When considering open supracondylar fracture of femur, the location of laceration plays an important role. 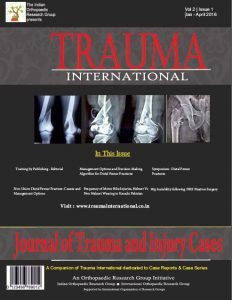 Severe soft tissue damage, comminution, extension of fracture into knee joint (9,10), neurovascular damage and injury to the extensor mechanism lead to unsatisfactory results in many cases whether treated surgically or non-surgically. In our case series, we found that thirteen patients having lacerations on the lateral aspect of the thigh did well post-operatively and gained functional range of movement as compared to the two patients who had lacerations anteriorly damaging the quadriceps. Though a complex and major surgery, it can be easily performed by a single experienced surgeon. At the same time the different aspects such as long duration of surgery (avg 2.43 hrs), blood loss (avg 840 ml), need for ipsilateral fibular graft and iliac graft and chances of post-op infection needs to be considered. All these factors can be reduced if two operative teams are simultaneously working. First team prepares the fracture site and fixation and the second team prepares the fibular and cancellous graft. In such instance the duration of surgery can be reduced and is possible to complete the surgery within tourniquet time. This would also reduce the blood loss and minimise the duration of the surgery. Other reported technique of doing two staged surgery is also beneficial in which first stage consists of debridement with antibiotic impregnated bone cement as a spacer  to bridge the bone defect till the wound heals so that the biofilm is formed around the spacer and the infection is cleared out. Once the wound is healthy, second stage i.e. definitive fixation can be planned by removing the spacer and using bone graft to bridge the defect along with internal fixation. Though this surgery is beneficial in cases of open fractures where chances of infection is high, bone cement spacer if left for longer duration can act as foreign body causing infection. We do not have any personal experience with this technique. Acceptable knee flexion following treatment ranges from 650 (brown et al, 1971) to 1170 (shelbourne et al, 1982). In our study average ROM was 00 – 1170 which compared favourably with the literature. We compared our results with other studies and found that our results were superior to them (Table no 1). 2. Schatzker J. Fractures of the distal femur revisited. Clin Orthop Relat Res 1998; 347: 43-56. 3. Sanders R, Regazzoni P and Reudi TP: Treatment of supracondylar intercondylar fractures of the femur using the dynamic condylar screw. J Orthop Trauma 1989; 3:214-22. 4. Babst R, Rosso R, Marx A et al: Six years’ experience with the Dynamic Condylar Screw in supra and intracondylar femoral fractures. Helv Chir Acta 1991; 57: 821-24. 5. Warmenhoven PG , VanMouriuk JB and Binnendijk B et al: The treatment of the fractures of the distal femur using the dynamic Condylar screw. Med Tijdschr Geneeskd. 1991; 135: 610-13. 6. Shewring DJ and Meggitt BF et al: Fractures of the Distal femoral treated with the AO dynamic Condylar screw. J Bone Joint Surg.1992; 74B: 122-30. 8. Dugan TR1, Hubert MG, Siska PA, Pape HC, Tarkin IS. 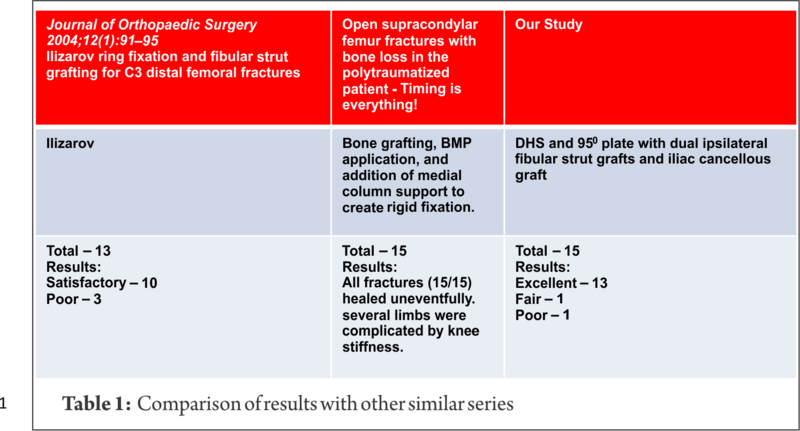 Open supracondylar femur fractures with bone loss in the polytraumatized patient – Timing is everything! 9. Hutson JJ Jr, Zych GA. 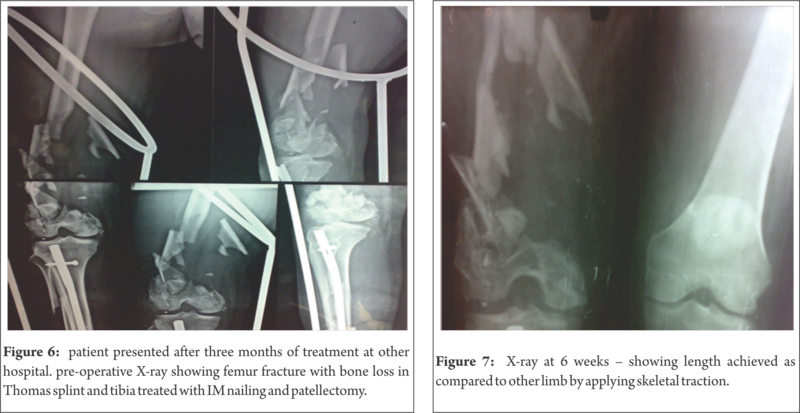 Treatment of comminuted intraarticular distal femur fractures with limited internal and external tensioned wire fixation. J Orthop Trauma 2000;14:405–13. 10. Marsh JL, Jansen H, Yoong HK, Found EM Jr. Supracondylar fractures of the femur treated by external fixation. J Orthop Trauma 1997;11:405–10. 11. Masquelet’s Technique for Management of Long Bone Defects: From Experiment to Clinical Application. ISSN 2073– -9990 East Cent. Afr. J. surg. (Online). 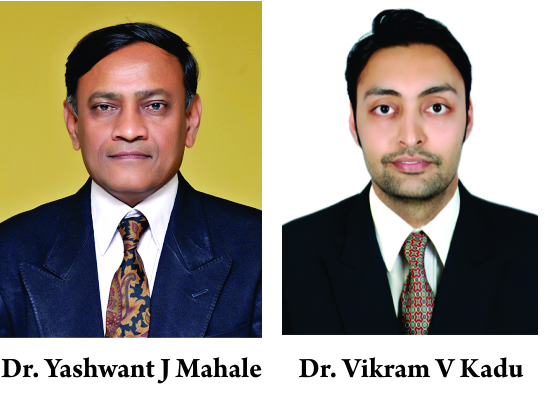 How to Cite this article: Mahale YJ, Kadu V. A Unique modality for treating Open Supracondylar fracture femur with bone loss. (Gustillo Anderson – 3B). Trauma International May – Aug 2016;2(2):44-49.